The Olympic champion, Missy Franklin, is the hot favourite in this race. Not only is she the gold medallist from London, she is also the fastest in the world this year dispelling any worries of a post-Olympic slump that can often affect athletes. I thought she might go for the world record in the semi-final, having cruised through her heat, but a slip on the start left her playing catch-up. Despite that, she flew through to set the fastest time in the semi-finals and go into the final as the top seed. She will have to be on top form to hold off the challenge of Olympic silver medallist, Emily Seebohm. The Australian was fastest through every round of qualifying in the Olympics last year, setting a new Olympic record in the process, but was just beaten in the final by the American. She is currently the third fastest in the world this year with 59.17, but if she can repeat the 58.23 that she swam in the heats last year, she has every chance of challenging Franklin here. She won her semi-final in 59.38 and will swim alongside Franklin as the second seed. The third podium spot should be between Japanese swimmer, Aya Terakawa, who won the bronze at last year’s Olympics, and Frankin's teammate, Liz Pelton. While Terakawa does not necessarily have the speed to challenge the two front-runners, she is remarkably consistent at swimming very good, if not outstanding, times. 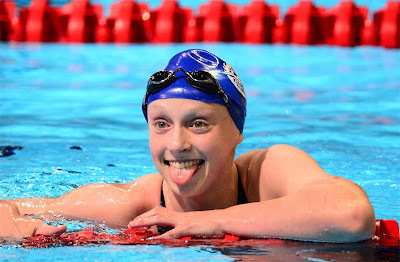 She has the second fastest time in the world this year at 58.84, which compares with the 58.83 that she swam at the Olympics, so we would expect to see a time around this mark from her here. Pelton, is an outsider for a medal after her 59.27 in the US National Trials. She is the fourth quickest in the world and might fancy sneaking a medal if any of the top three are having a slight off-day. Fu Yuanhui is the sixth fastest in the world, but the fastest over 50m. If she can get a good start, she will be looking to use that pure speed to keep herself in contention, but at just 17, there are questions over whether she is ready to seriously compete at these major championships. She finished second behind Franklin in the second semi-final, but was only the fifth fastest qualifier for the final. Ryan Lochte looks to be the man to beat in this event. Anyone following on Twitter would have seen me tip him up at 11/4 earlier today and he backed up this support in finishing second in his semi-final. Despite being beaten by Danila Izotov, he appeared very comfortable and certainly looked as though he could go faster. He may only have the sixth fastest time in the world this year, but the form of the other favourites means that he will fancy his chances of gold. Danila Izotov is the top seed coming into this final after winning his heat in 1:45.84 and looks to be the closest challenger to Lochte. He won this event in the Summer Universiade earlier this month and seems to have brought his form into this. He may not be the most elegant swimmer, but he is very efficient and will fancy his chances of challenging for the gold medal. Yannick Agnel came into this event as a strong favourite, but has not enjoyed a good World Championships so far. He had to battle hard to come through his heat in second place, but is only the fifth seed for the final and he did not look to have much extra in the semi-final. He may be the Olympic gold medallist and third fastest in the world this year, but it would be a surprise if he is involved in the fight for gold. Bronze may be his best hope here. Kosuke Hagino showed again that he is incredibly fast in the final 50m as he went over half a second quicker than anyone else in the field. The key if he is to challenge for the gold medal is to ensure that he is within touching distance of Lochte and Izotov coming into the final length. Whether he can win the gold is unclear, but I certainly fancy him to finish ahead of Agnel and pick up at least a bronze medal. Conor Dwyer, Thomas Fraser-Holmes, Robbie Renwick and Cameron McEvoy are the other four in the final, but it would be a surprise if they were to challenge for the gold medal. A good swim from one of them might challenge for bronze though. Katie Ledecky will win this race - the only real question is whether she can break the world record. She was the second fastest in qualifying, but she could easily take 0.1 seconds each 50m off that time. She already has one gold medal from the 400m and it would be a huge shock were she not to win a second here. Her closest challenger will be Lotte Friis, who swam an excellent time today to qualify as the top seed for the final. It seemed as though she was testing herself against Ledeceky's likely time and she was quicker through the first half, but seemed to tire slightly toward the end. She will benefit from being alongside Ledecky tomorrow, but it would be a surprise if she can stay with the American teenager. Outside of them, it comes down to who will win the bronze. Mireia Belmonte will have the support of the home crowd, but will have to fight against Lauren Boyle and Kristel Kobrich. This should be an interesting race as the French take on the Americans. Olympic champion, Matt Grevers, was unconvincing during his heat this morning, but came back strongly to qualify fastest for the final in a time of 52.97. 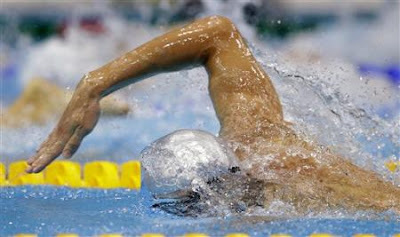 As well as given him the top seeding for the final, it was the fastest time in the world this year. His teammate, David Plummer, was the quickest in the heats and the second fastest in the semi-final. He had the quickest first 50m split of anyone in the semi-finals, but was brought back by Grevers in the second half of the race. He is the second seed and will race alongside Grevers in the gold lanes in the final, which will give him the opportunity to match his illustrious teammate. The French challenge is led by Jeremy Stravius, who is the second fastest man in the world this year. He won his semi-final in 53.23 without looking too troubled, although he did have to push during the final few metres to hold off his compatriot, Camille Lacourt. Lacourt is the fifth seed for the final, although the defending world champion looks to have a lot to make up if he is to defend his title. While the medallists are likely to come from those four, it would be dangerous to write off the Japanese pair of Ryosuke Irie and Kosuke Hagino. Irie is the fourth seed having come in behind the American pair in his semi-final, while Hagino will again depend on his fast second half of the race. Despite only being the sixth fastest qualifier, he had the fastest final 50m, so if he can start well and remain in touch, he could challenge late on. Ruta Meilutyte came close to breaking the world record in the heats, before coming back in the evening to break the record in her semi-final in a time of 1:04.35. She comfortably had the fastest reaction time, her first 50m was less than 0.2 seconds outside the 50m record and her final 50m was over 0.6 seconds quicker than her nearest rival. The only real question is whether she can break the record again in the final - if she can judge the finish better, there is every chance. Yuliya Efimova swam very well to try and go with Meilutyte and will have been very happy with her time of 1:05.29. She looks a very good prospect for the silver medal, but it will need the Lithuanian to have a serious problem if Efimova has any chance of taking gold. Jessica Hardy saw her world record broken earlier, but was only able to finish second in her heat. While she looked good, it is tough to see her getting close to Meilutyte, but she should be involved in a three-way fight for the minor medals with Efimova and Pedersen. Pedersen won her semi-final ahead of Hardy and will be looking to replicate that swim in the final. If she can, she will definitely clinch a medal.